Rigid box section back legs with cross bracing. Includes plastic top tool tray. Many occupations that involve manual work can lead to spending a lot of time up a ladder. It is important to have a sturdy piece of equipment that will support an employee while they are working. Our industrial and general purpose platform stepladders are an ideal choice to use while working at height. 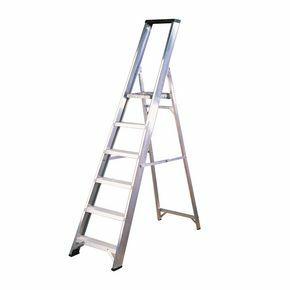 They are certified to BS2037 so you can be confident these are quality ladders. They have strong aluminium side arms for support and rigid box section back legs with cross bracing to keep them stable while in use. A strengthening beam is incorporated into the slip resist treads adding to the stability of the equipment, allowing the user to work confidently on their tasks. There is a choice of eight sizes; 3 tread, 4 tread, 5 tread, 6 tread, 7 tread, 8 tread, 10 tread or 12 tread. These stepladders are light weight and easy to carry, ensuring they are convenient for transporting around a workplace. An added benefit of these ladders is that they include a plastic top tool tray, providing an excellent way for the user to keep tools close by while working at height. Our industrial and general purpose platform stepladders are great pieces of equipment for working at height and they come with FREE UK Delivery.